Democrats and a small group of Republicans will lead the Alaska House in a coalition when lawmakers return to Juneau this year, legislators announced Wednesday. The formation of the new House coalition, with 17 Democrats, two independents and three Republicans, marks a huge shift from the GOP-led organizations that have controlled the chamber for more than two decades. Dillingham Rep. Bryce Edgmon, a Bush Democrat who has previously joined Republican-led majorities and was first elected to the House in 2006, will replace Rep. Mike Chenault, R-Nikiski, as speaker. Anchorage Republican Rep. Gabrielle LeDoux will hold a key leadership job as chair of the House Rules Committee, while Anchorage Democratic Rep. Chris Tuck, the former minority leader, will be majority leader. Reps. Paul Seaton, R-Homer, and Neal Foster, D-Nome, will be co-chairs of the House Finance Committee. Rep. Louise Stutes, R-Kodiak, was named majority whip. After this year's legislative session ended in paralysis and infighting in the House, members at a news conference Wednesday afternoon said they coalesced around a view that the state's multibillion-dollar budget deficit needed swift resolution. 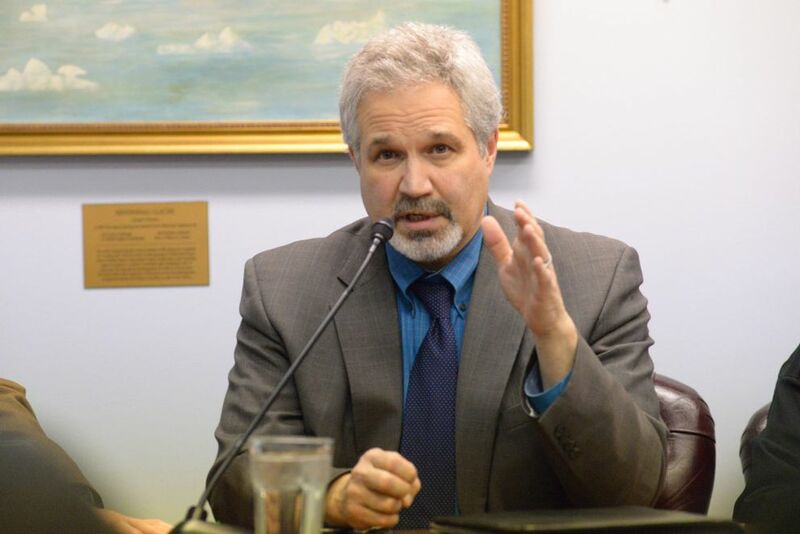 Seaton described the coalition members' shared vision as a "comprehensive fiscal plan" — a concept, he said, that would include spending cuts, a restructuring of the Alaska Permanent Fund, and a broad-based tax. "We've come together around the idea that it has to be a comprehensive fiscal plan to get there," he said. "You can't just solve one piece of it." The Senate majority also organized itself Wednesday and will be more conservative than the House, with Republicans remaining in charge. Sen. Pete Kelly, R-Fairbanks, will be president, said one of the members of the new leadership, Sen. Peter Micciche, R-Soldotna. 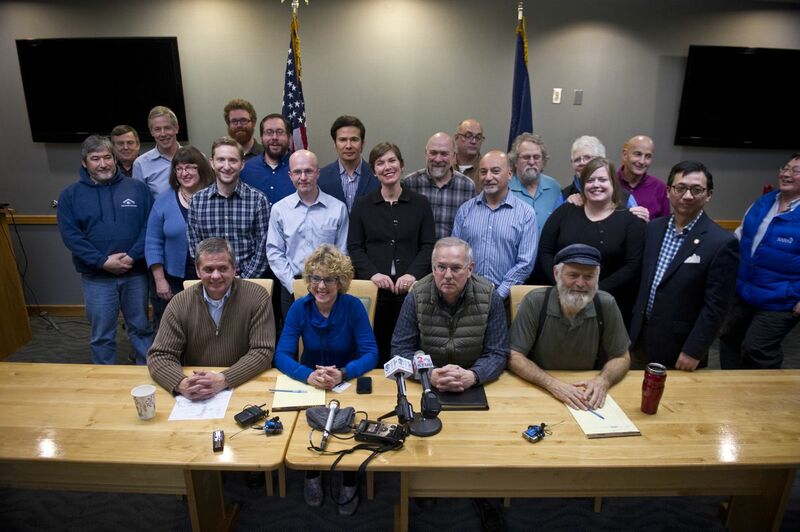 The announcement of the new House majority caucus came after Democrats met with the moderate Republicans in an Anchorage hotel conference room Wednesday morning. They taped paper over windows to keep people from peering inside. Legislators had been discussing the possibility of a House majority coalition for months, and Tuesday's election results — in which voters appeared to have dispatched two Republican incumbents, with a third clinging to a narrow lead — cemented the deal. LeDoux was first elected to the House from Kodiak before she moved to Anchorage, and like Seaton and Stutes has been a coastal-region moderate. They're the only Republicans in the House's new majority. But all three landed leadership spots, demonstrating how the Democrats, with their 17 members, need GOP lawmakers to help put them over the 21-member threshold to form a majority in the 40-member House. 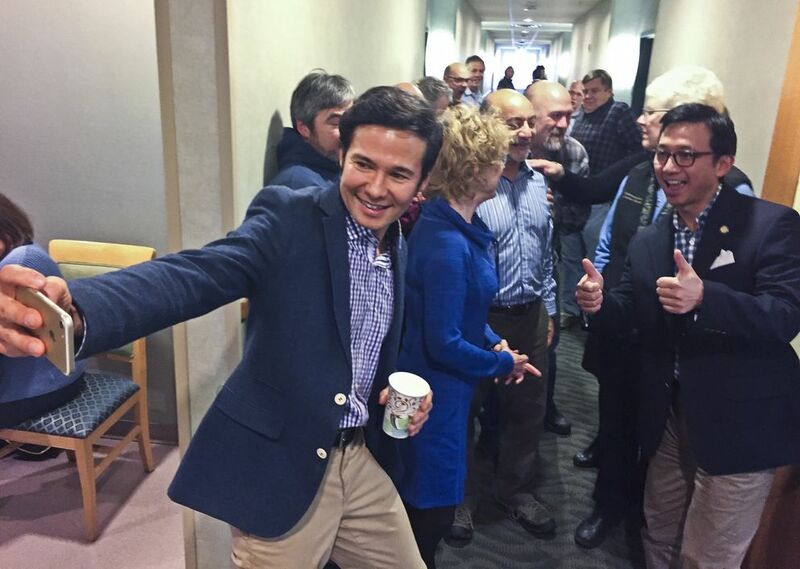 Two independents, Ketchikan Rep. Dan Ortiz and Jason Grenn of Anchorage, who's leading incumbent Republican Rep. Liz Vazquez in Tuesday's election, expanded the new majority's membership to 22. Coalition leaders said they're willing to add others, and at least one Republican, newly elected Gary Knopp of Kenai, left the door open to the possibility of joining, saying in a phone interview he'd have to find out if the new coalition shared enough of his ideas. Joining the coalition, however, presents risks for Republicans: The GOP members faced swift and searing criticism from Alaska Republican Party Chairman Tuckerman Babcock, who said their decision to run as Republican candidates, then caucus with Democrats, amounted to a "deception." And he vowed to try to depose them in two years. "You can expect that I, as chairman, will recommend to the State Central Committee that the Alaska Republican Party begin to actively recruit and support a transparent, honest member of the Republican team for the next election cycle," Babcock said in a two-page letter to the three GOP coalition members. Even before the election, however, it was clear LeDoux and some of her allies were at odds with the Alaska Republican Party's leadership. The party's official spokesperson, Suzanne Downing, last week blogged about a proposal by another Republican candidate, Kevin Kastner, to shut down a fundraising scheme devised by LeDoux. And party officials spent time and money supporting a GOP primary candidate, George Rauscher, who defeated incumbent Rep. Jim Colver, R-Palmer, who along with LeDoux was part of the Musk Ox Coalition, a moderate faction of the current Republican majority. LeDoux, in a phone interview, said she understood Babcock "has his feathers ruffled." But, she said, she thought her colleagues in the new coalition were more willing to consider a broad deficit-reduction plan, instead of one focused solely on budget cuts and reductions to the Permanent Fund dividend. "My allegiance is to the state and to my district," LeDoux said. "We're forming this caucus with a main goal of getting things straightened out with our state's fiscal problems. And we look forward, actually, to others who have that same commitment joining us — regardless of what letter is after their names." The Senate, meanwhile, will be run by Kelly, a social and fiscal conservative. A formal vote on his presidency, and Edgmon's speaker's post, will be taken when the session begins in January. 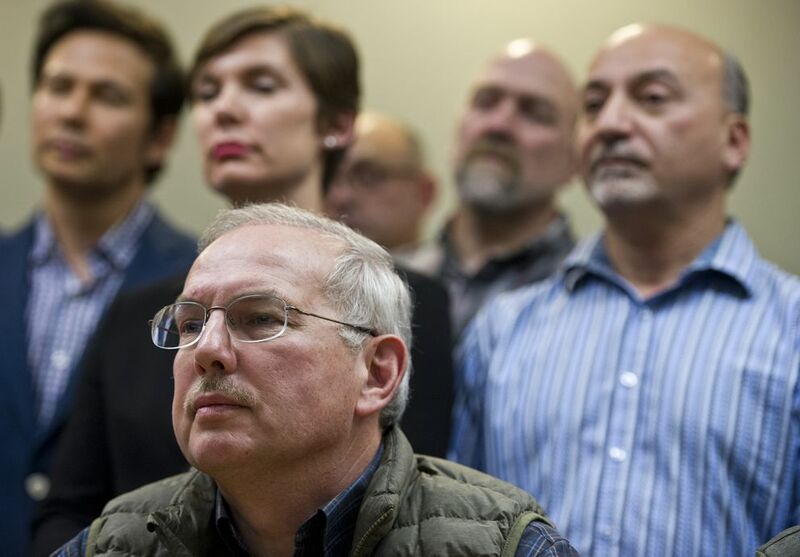 A caucus usually lasts the two-year life of a Legislature, though "coups" in the past have changed presiding officers and leadership in midstream. In a prepared statement, the Senate majority announced Micciche would be the new majority leader, while Eagle River Republican Sen. Anna MacKinnon and Bethel Democratic Sen. Lyman Hoffman will be co-chairs of the Senate Finance Committee. The finance committee shapes state spending along with its House counterpart, and will likely have a big role in determining whether lawmakers tackle Alaska's multibillion-dollar budget deficit. The other members of the new Senate Finance Committee will be the same as this year's — Republicans Micciche, Click Bishop of Fairbanks, Mike Dunleavy of Wasilla, and Democrat Donny Olson of Golovin — with the addition of newly elected Natasha von Imhof, an Anchorage Republican. Olson will serve on the committee as a member of the Senate's Democratic minority. Anchorage Republican Sen. Kevin Meyer, the current Senate president, will remain in leadership as the Rules Committee chairman, a post that empowers him — and LeDoux in the House — to decide which bills get votes on the floor of the two chambers. The rules committees become especially potent toward the end of a session, when bills are stacking up, and can be a venue for last-minute compromises. The Senate's Republican-led organization, which currently claims 16 of the chamber's 20 seats, had been widely expected to remain intact when two GOP incumbents, John Coghill of North Pole and Cathy Giessel of Anchorage, fended off well-funded challengers in Tuesday's election. The new Senate majority will be reduced by one member, with Olson back in the minority after joining the Republicans for part of this year's legislative session. The looming question for next year's session is whether Kelly's conservative organization will be able to overcome deep ideological differences with the Democrats and moderate Republicans who will control the House, and pass legislation. The Senate this year resisted Democratic proposals for higher oil taxes, as well as the broad-based taxes Seaton said will be a key piece of the House's budget reforms. Asked about the new House majority's agenda, Micciche, the new Senate majority leader, said his chamber would remain focused on three different priorities — which include "revenue" in addition to budget reductions and reforms. "We're willing to work with whatever organization forms on the House side for solutions to Alaska's fiscal problem," he said. "As long as they are carefully considered to have the least negative impact to Alaska's families and our economy." * Health and Social Services, Sen.-elect David Wilson, R-Wasilla. * Judiciary, Sen. John Coghill, R-Fairbanks. * Resources, Sen. Cathy Giessel, R-Anchorage. * State Affairs, Sen. Mike Dunleavy, R-Wasilla. * Community and Regional Affairs, Sen. Click Bishop, R-Fairbanks. * Labor and Commerce, Sen. Mia Costello, R-Anchorage. * Transportation, Sen. Bert Stedman, R-Sitka. * Education, Sen.-elect Shelley Hughes, R-Palmer. * Legislative Budget & Audit, Sen. Gary Stevens, R-Kodiak. * Health and social services and education, Sen.-elect Tom Begich, D-Anchorage. * Judiciary and resources, Sen. Bill Wielechowski, D-Anchorage. * State affairs and community and regional affairs, Sen. Berta Gardner, D-Anchorage. * Labor and Commerce and Transportation, Dennis Egan, D-Juneau.